The start of 2017 might seem like a way off, but it will soon come around. To put it in perspective, there are only just over six weeks until Christmas - isn't time flying this year? So, instead of leaving it until the start of the new year to make your resolutions, why not get a head start and make them now? According to studies, most New Year's resolutions revolve around our health. As well as the things that we want to change about ourselves and our lives. So, if we're going to use the start of the new year to improve our health, why not get a head start now and start 2017 feeling healthier and happier? Do you love the idea to starting the new year feeling better about yourself? Then, it's time to think about making some lifestyle changes to give your health a boost. When it comes to making these types of changes, it's important to understand that it's not always easy. It takes time to adapt to health changes and can be stressful at times, but it's important to remind yourself that it's worth it. To help you choose which lifestyle changes to make, below are suggestions of some of the things that you can do to give your health the biggest boost. Are you someone who eats a lot of junk food? Or, someone who tends to eat a lot of ready-made foods, such as premade pasta sauces, ready meals, and pre-cut chips? If the answer is yes, and you want to boost your health, eating healthier could be a good start. It doesn't matter if you're fit as a fiddle and the perfect size, eating well isn't just about weight, it's about being healthy. Even if you can't see the impact of living off of junk food, there will be one. For example, hydrogenated fats found in most junk foods can cause a buildup of fat around the heart. This increases your chances of suffering from a heart attack. Or, for instance, studies have shown that the majority of cancers are linked to junk food in some way or another. This is due to the additives, preservatives and other nasties found in these foods. So, if you want to give your health a boost, make an effort to eat a little cleaner. Fill your plate with superfoods instead of junk foods. You'll be amazed at how much healthier you will feel by adding more superfoods to your meals. Think lean meats and fish, lots of vegetables, wholemeal bread, wholewheat pasta, and lots of grains. Believe it or not, eating healthy foods isn't boring because there are thousands of recipes and ideas online to try. So, give clean eating a go and see what you think - the chances are you'll feel much healthier for it. Studies have shown that drinking a couple of glasses of wine a week could actually be beneficial for our health. Drinking excessively, however, is not. If you're someone who likes to go out on a Friday or Saturday night to celebrate the end of the week, then you may be drinking a little too much. Although it's fine to let your hair down every so often, you don't want to be drinking too much on a regular basis. As otherwise, it could have a negative impact on your health. To give your health a boost, consider cutting down on the amount of mojitos that you're drinking each week. 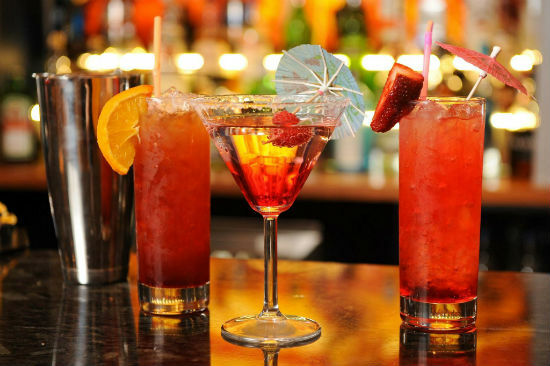 How about alternating between alcoholic and non-alcoholic drinks when you go out? Believe it or not, mocktails can taste just as delicious as cocktails, plus they're much cheaper. So, on your next night out, alternate between cocktails and mocktails, and see how you feel. The chances are you'll still have an amazing night, will spend less money, and will wake up feeling a lot brighter in the morning. There's nothing wrong with having the odd drink or two now and then, but when you're drinking a lot of alcohol, it can start to impact your health. So, aim to reduce the amount of alcohol you're consuming by half, and aim to alternate alcoholic and non-alcoholic drinks on nights out. No matter how well you eat and how often you exercise, if you smoke, you can never be truly healthy. This is because the damage that smoking does to your body is so severe that you can't be healthy unless you quit. Not only does smoking damage your lungs and make you more prone to developing a range of cancers, but it also impacts your skin, teeth, and nails. Studies have shown that people who smoke are not only more prone to premature aging, but also that they're more likely to suffer from acne. If you've been wanting to quit cigarettes for good for a while, now could be a perfect time. It isn't something that will be easy. However, if you're able to stay on the wagon, quitting smoking will not only boost your health but will also improve your life. A hack for quitting smoking that a lot of ex-smokers swear by is vaping. This is because vaping allows you to hold something in your hands like a cigarette and get that nicotine hit that you need. The great thing about vaping is that you can choose the strength of nicotine that you want in your e-liquid, and can slowly wean yourself off of it. Visit a vape shop, and you can see all of the different nicotine strength options, as well as the different vaping equipment options. If you want to quit smoking for good, vaping could just be your best chance of doing so. A mistake that a lot of us make when it comes to our health is not making our mental health a priority. Being healthy isn't just about being physically healthy, it's also about being mentally healthy. Because believe it or not, if your mind isn't healthy, it can have a big impact on your overall health. Take anxiety, for instance. People who suffer from anxiety - a condition often linked to stress, tend to struggle to do simple daily tasks. These include leaving the house and speaking to people. This can make it almost impossible for them to stay in shape and lead a healthy and happy life. One of the best ways to keep your mind healthy is with meditation. Studies have shown that exercise that's focused on meditation, such as yoga, can help to calm and soothe the mind, relieving stress and preventing mental health problems. Research has shown that practicing yoga on a daily basis can help sufferers of conditions like anxiety, to lead more normal lives. It also helps to prevent mental health problems in the first place. This may not seem as important as changes like quitting smoking but, believe it or not, the beauty products that you use have an impact on your health. From bubble bath and body creams to makeup and perfume, each and every beauty product has the potential to impact your health. Did you know that when you apply a product to your skin, be it a face cream or a lip balm, some of that product goes into your body through your skin? That's why it's so important to be careful about the beauty products that you use. As, if you're using products containing chemicals, those chemicals can end up in your body. Believe it or not, many of the chemicals in beauty products have been linked to various health problems, including cancers. So, if you want to give your health a boost, consider swapping to using only natural beauty products. Admittedly, it might cost you a little more, but can you really put a price on your health? Last but not least, studies show that the majority of us don't make time for ourselves. We spend most of our spare time running around after other people. However, if we want to keep ourselves healthy, we need to set aside some time each day for ourselves. This is because when we spend all of our time rushing around, we get run down and end up exhausted. This can then make us more prone to becoming unwell. So, it's important that each day we make a little time for ourselves. So there you have it, some ideas and suggestions for boosting your health ready for the start of the new year. Instead of beginning 2017 with a list of changes you want to make, you could start it with a list of health goals you're glad you accomplished in 2016. Wouldn't that be a great way to start the year? Yoga is an excellent one!